On his meteoric rise up the ranks of the U.S. Army, one passion never left retired four-star Gen. Peter Chiarelli’s side: his care and concern for the welfare of the men and women who wear the uniform in service to their country. He was particularly concerned about those who return home with profound but invisible wounds of war. 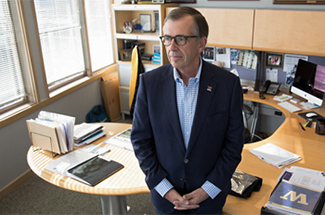 That passion for those suffering from traumatic brain injuries and post-traumatic stress has led Chiarelli, ’80, to lead One Mind, a nonprofit dedicated to speeding up research and finding better diagnosis and treatment for brain-injured soldiers and civilians. For his service to the country and his lifelong compassionate commitment to soldiers, the UW presented Chiarelli with the 2016 Distinguished Alumni Veteran Award. Among his continuing commitments is an interest in strengthening the UW’s Army ROTC program and fostering the involvement of more veteran alumni. The son of a meat cutter, Chiarelli, who grew up in Magnolia, did two combat command tours in Iraq. For two years, he was commander in charge of day-to-day operations in Iraq. That’s when his education from the Daniel J. Evans School of Public Policy and Governance really kicked in. “The Evans School taught me to be a critical thinker in overseeing the provision of basic services,” he says. Chiarelli, who also served as Vice Chief of Staff of the U.S. Army for four years, is the highest-ranking alumnus Army officer to have served in Iraq in the UW’s history. As vice chief of staff, Chiarelli had responsibility for overseeing medical services in the army. “All the nurses and doctors belonged to me. I had a three-star general reporting to me but I was responsible for the whole enterprise,” he recalls. In the job, which he held for four years, Chiarelli visited every U.S. Army hospital – and what he saw surprised him. He had been prepared for lost limbs and nasty wounds. But what he encountered was lots of traumatic brain injury and post-traumatic stress. “By 2012, the rate of post-traumatic stress was 65 percent,” he says. Neither the army nor the civilian mental-health system was prepared to deal with this scale. Moreover, the U.S. Army had the highest suicide rate among the services at 23.8 per 100,000 soldiers, according to the 2014 Defense Department Suicide Event Report. Plus, once soldiers suffer these kinds of injuries, there is not much in the way of diagnostic ability and treatment. Chiarelli compares this situation with how modern the system is to diagnose and treat heart attacks. “If I have a heart attack, the physician will draw blood and if he or she sees the substance troponin, he will rightly conclude that I’ve had a heart attack because troponin serves as kind of a footprint at the crime scene. You don’t get that with head injuries. You can’t look at somebody and tell if they are suffering from head injuries or traumatic stress,” he explains. The need for progress in this area is urgent because these conditions often translate to suicide, broken marriages, addiction and subsequent homelessness. Chiarelli is impatient with the level of progress and the tendency of researchers to hoard their discoveries instead of taking a more “open science” approach of sharing data. One of Chiarelli’s proudest moments came at Meany Hall in 2012, when he presented the Congressional Gold Medal to Nisei veterans who served during World War II even though many of their families had been rounded up and placed in internment camps for the duration of the war. “Some of them couldn’t stand. There were 82 of them. I have never been so honored in my life,” he says. Chiarelli also has deep feeling for his alma mater. All three of his children graduated from the UW. And Chiarelli was particularly close to Brewster Denny, ’45, founding dean of the Evans School who died in 2013. Four or five times a year, Denny and Chiarelli would speak by phone regardless of where Chiarelli was stationed around the world. “[Brewster] opened up my mind. I feel that some of the smartest people in the world are at the Evans School,” Chiarelli says. Chiarelli’s passions also include Husky football, something he started attending at the age of five. That devotion is strong as ever today. “Every February, I had to ask my wife for a check for Husky tickets because I wanted those football tickets even though I couldn’t go to the games,” says Chiarelli, who since retiring from the army can be found at about every game in Husky Stadium. He’ll be cheering on his beloved Huskies with the same passion he cares for his soldiers. For more information about DAVA and the previous recipients, visit uwalum.com/dava.